… and start again: combining high-spec engineering with style and speed, the Hunton 1005 rigid inflatable powerboat is rewriting the speedboat rulebook. Julian Allason tries out the supercar of the sea. We are heading out of Lymington harbour for sea trials in the Solent when the marine busybody intervenes. 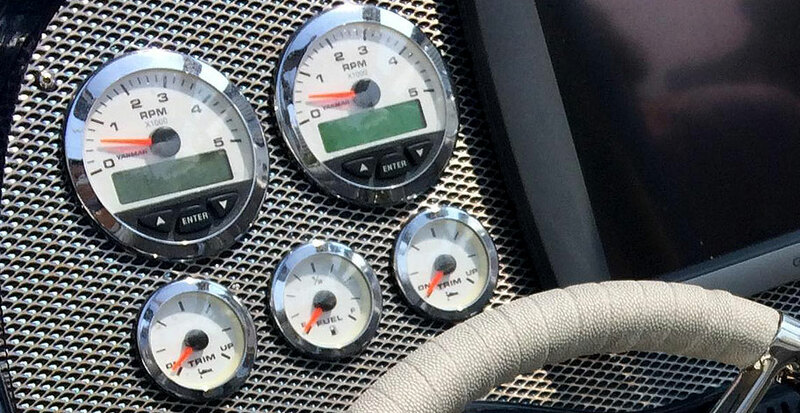 “Oi, do you know what the speed limit is in this channel?” Hunton Powerboats’ head of customer relations, Martin Payne, who is test-driving the boat, does know, and if we are over it is only by a knot or so. “He just wants to see the boat up close,” Payne says equably. Almost everyone does. 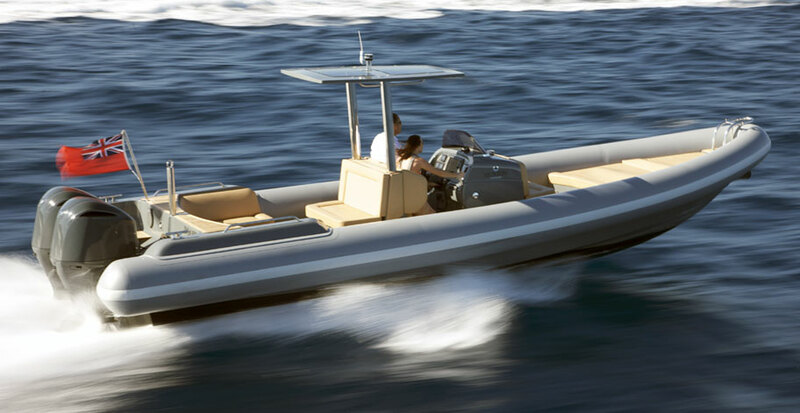 For the Hunton 1005 is to rigid inflatable boats (RIBs) what Aston Martins are to commuter cars: a wonderfully satisfying blend of engineering and style that goes very, very fast. twin 300-horse Mercury Vorado outboards. There is no shortage of powerboats on the stretch of water between St Helens Fort and the Needles, those chalky dentils that serve as the Isle of Wight’s prow. But very few of them offer the gut-busting power-to-weight ratio of this 10m RIB. For much of its body is comprised of the fresh air that fills the five-chamber Hypalon tapered tubes, making it light and all but collision-proof. At the summit are bespoke houses such as Hunton in Romsey, Pascoe in Southampton and the Italian Dariel, all operating more like supercar makers than traditional boat builders. Even some of the materials are shared – notably Kevlar and the latest iteration of carbon fibre. Add in advanced electronics, as well as engineering that is capable of withstanding (and damping) the juddering of high-speed operation, and the analogy holds up as well as a pilot boat in a storm. Like the Formula One influence on contemporary supercars, it is race experience that informs the handling of boats such as Hunton’s 1005. For in the 1980s heyday of British powerboat racing, Jeff Hunton was six-times British champion and his designs carried off many of the class trophies. Speeds feel like triple their true level, especially when the entire boat is airborne, propellers screaming. On the spec, the 1005’s top speed is given as 60 knots a splash under 70mph. The website admits to 65 knots. We seem to be doing all of this. In an open RIB motorway speeds feel like triple that, especially when the entire boat is airborne, propellers screaming as they bite the sou’westerly. Even at the stern, crammed against the U-shaped seating and subject to the least vertical movement, it feels somewhere between terrifying and the most fun one can have with wet clothes on. In fact, the boat is surprisingly dry, the hull and tubes deflecting most of the spray outward. In some conditions, it can look as if it is powered by waterjets, as a defined mist shoots out aft, soaking anyone unwise enough to attempt to follow in the calmed wake. If the design were aimed only at British racers and enthusiasts, Hunton Powerboats would doubtless have remained what one shareholder described as “an expensive hobby”. But seeing the opportunity to capture the more design-orientated, less weatherbeaten Mediterranean market, a pair of investors has recapitalised the company to sell the range into the sunshine. Hence the rakish looks, teak decking and high-spec standard equipment. Exactly what you might want to secure one of those precious berths in Portofino or St Tropez, ports where style matters but performance anxiety is inadmissible. When the boat was given a showing in Cannes last autumn, it provoked immediate enthusiasm from the proprietors of seafront villas. Superyacht owners, ever on the lookout for fast tenders, liked the muscle and low-key styling. They are also held to look good on classic modern sailing yachts such as Lady B and Marie. “Light weight and manoeuvrability are what you want for rapid launch and easy recovery,” was what Sandy Yawn, captain of Pure Bliss, a 43m superyacht widely admired in the charter market, had said to me a few weeks before. Watching as the vessel made way to disembark guests in a rolling swell off Portofino’s shopping paradiso, I saw her point. “And RIBs don’t chip the paintwork,” she might well have added. Up to now, yacht tenders have been regarded with maritime amusement as mere ski boats suitable for towing wakeboards and inflatable bananas. Not any more. With an aeroplane to catch from Nice and our superyacht delayed by partying, it was a white-knuckle RIB ride that got me to the airport on time, albeit with damp luggage. It seemed a small price to pay for a connection that turned heads usually immovably fixed upon their own vessels. With the extended range – 250 nautical miles in the 1005 chef can be dispatched to local markets while one’s superyacht continues on course, a serious consideration when making passage for Sardinia or somewhere equally far off the Riviera milk run beloved of charterers. It also opens up the possibility of fast expeditions into the likes of Venice, where port fees are prohibitive and berths hard to come by. Docked in Monte Carlo but bored by Monégasque cuisine? The waterfront restaurants of St-Jean-Cap-Ferrat and Villefranche are hopeless by road in summer, but no distance in a fast RIB, with little risk of being stranded should the wind get up. A measure of the interest on the part of the admirals of ultra-luxury can be gleaned from a glance at the list of equipment and extras. Hydraulic seats? Standard. And who knew that a head console could be incorporated into an RIB, complete with sea toilet, mirror, lighting and pressured fresh water supply? In addition to the Garmin 5012 touch screen GPS/ plotter/sounder and the Icom DSC VHF radio fitted as standard, there is no end to the sort of electronic options one would expect to find on much larger vessels, including radar and security systems. My own choice would be for inboard diesel engines or even a jet drive, to propel the boat using spurts of water. With my past misadventures in RIBs, the self-righting kit might be a good one to consider too. Fortunately, radio, CD player and speakers are all waterproof these days. Which is more than can be said for us. 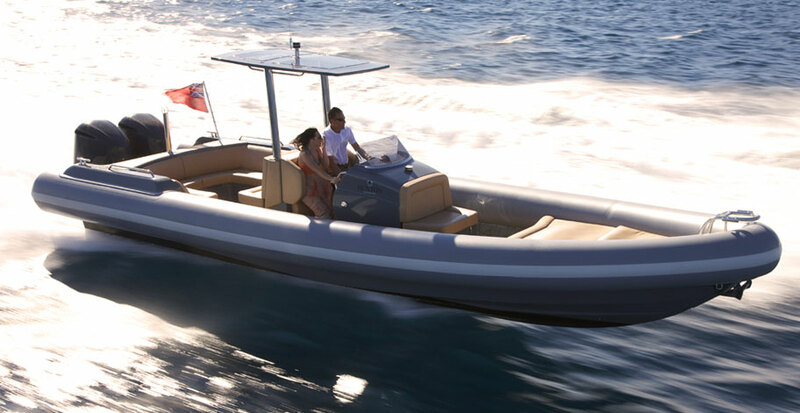 Thanks to the positive response British boats are now receiving in the Med and Scandinavia, the RIB renaissance looks set not just to continue but to widen into the even-larger market for what might be described as “powerboats with cabins”. When Hunton’s 13m flagship, the XRS43, is launched at the London Boat Show this month, interest is expected to be intense, judging by industry buzz. Indeed, three have already been ordered off-plan by How To Spend It readers. Jeff Hunton’s XRS43 interior again reminds one of the interior of an Aston Martin, plus a couple of Mulliner Park Ward coachbuilding references thrown in with the leather-like upholstery. Open, light and luxurious, it conveys the sense of a space that is secure and welcome when the upper deck needs to be cleared for speed. Such designs offer the possibility of weekending afloat or putting up at a hotel 100 miles up the coast – with all the fun of getting there very fast. My longest small boat voyage to date was from Chelsea to Southampton Water, which took three days in a top-heavy cabin cruiser that eventually found its natural home on a small, calm lake in Wales. Payne, on the other hand, recently took the 1005 RIB to Alderney. Some daytrip. It’s not just a question of money. Costing £202,800 in its standard configuration, the 1005 is at a price that allows off-the-trolley use or glamorisation up to superyacht levels. The XRS43 clocks in at more than twice as much (£522,000) for what one might well judge to be double the sophistication and comfort. So even in pricing, the analogy with supercars holds. And, truth be told, they are likely to appeal to very much the same purchasers. Indeed, last year I spotted an Aston with a tow hook near Buckler’s Hard in Hampshire. It seems a safe bet that it hadn’t been pulling a caravan.